I am a bit 'under the weather', the details of which I'll spare you. I got wrapped up with candy making and researching Scottish Tablet recipes. I'll probably be making more Scottish tablet today...well, that or an English candy I'm interested in trying out. The tablet trials have been frustrating, the taste is correct but the texture is just a tad off. Tablet is one of those curious candies that is supposed to be grainy, but not as grainy as my last batch. So I need to figure out what I need to change to get the appropriate texture. I'm so glad I tried some delicious Tablet from a candy shop while in Edinburgh, or I would never have known what I was aiming for. Not part of a calorie controlled diet! My trails haven't been made easy, as finding good recipes for the stuff has been difficult. Some Tablets are clearly too pale, or too smooth. Some are written by folks who have admittedly never stepped foot in Scotland, which I admit is a bit of a concern. Other recipes are probably great but too imprecise, "a teacup of cream", "cook for 20 minutes", "until it hits a (insert arbitrary color description here) color". So back to the kitchen I go. If any one knows of a good tablet recipe and doesn't mind sharing, please send it my way. Also, I'm curious if tablets are ever flavored. I'm considering spiking a batch of tablet with whiskey, once I work out all the kinks. It seems like a natural paring with the butterscotch flavored confection. So our last two pies were submitted by two bloggers, Amanda of Cakes & Neckties and Zoe of Z's Cup of Tea. 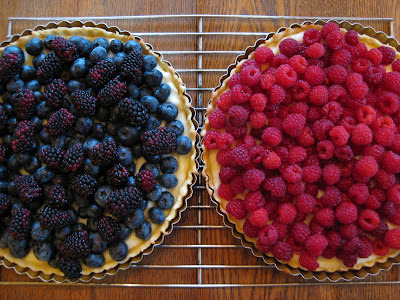 They're both fruit tarts, a delicious summertime classic around here, but they couldn't be more different in terms of ingredients. 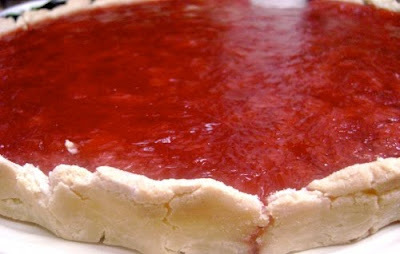 One tart uses all the traditional pie making ingredients: butter, sugar, flour. The other is gluten free, dairy free, and cane sugar free. Clever, eh. Yes, I am having fun pairing opposites. This pie is deceptively simple (people will look and exclaim "Oh my! You shouldn't have gone to such trouble! Clearly you are a baking master!" and only you will know the truth about how quickly it came together). But, it is absolutely dependent upon the fruit. Your pastry can be perfectly turned and your filling smooth and rich, but if it's not time for local berries, then it's simply not the right moment for this pie. It pays to be patient, and to put the recipe in your calendar for when raspberries, blackberries and blueberries are in season. In my case (Toronto, Ontario) berry season peaks late July and early August, which is also when my parents' birthdays both fall. During family get-togethers, dessert is my department (my brother is in charge of supplying the adorable grandson, and my kitten provides the chaos and furniture-destroying power), and with two birthdays so close together, it's tempting to make one dish cover both occasions. My own approach falls at the opposite end of that belief spectrum and instead, I figure it's the perfect excuse for not one dessert but two! 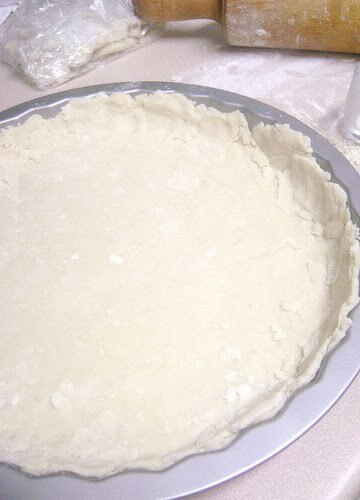 To assemble the pie, prepare the pastry long enough ahead that you can chill it at least 30 minutes--this is especially important if you're baking in summertime, since the temperature of the fat and water in the dough will affect how it behaves in the oven. You can bake the pastry up to one day ahead. The day of serving, fill the shell with fresh pastry cream, Bavarian cream (in my photographs), or mascarpone whipped with heavy cream and mild honey, then top with fruit immediately before serving. If you chill the assembled pie, it makes slicing easier, and the berries perspire as they return to room temperature, which from a purely aesthetic standpoint is really quite pretty. 1. In a large bowl, whisk together the sugar, 1 cup of flour, and salt. 2. Cut the butter into one-inch cubes then toss to coat in the flour mixture before gently rubbing the butter into the flour with your fingers. You want the butter to remain as cold as possible, so work quickly and use a light touch. Another excellent method is to grate the butter through the coarse side of a cheese grater directly into the flour mixture, then gently work it in. The texture should resemble coarse meal, with some larger pea-sized lumps of butter. 3. Sprinkle one tablespoonful of milk or cream over the dough and begin gathering the dough into a shaggy ball using your hands. If it seems too moist, see step 4 below. If the mixture is too dry, add the second tablespoonful of milk/ cream and work it in, gathering the dry crumbs and loose flour into the dough. 4. If the mixture seems very greasy and buttery, sprinkle additional flour over the dough 2 tablespoons at a time, working quickly so that the dough doesn't get too warm. 5. Spread the dough into a lightly buttered tart pan with removable bottom and use your fingertips to press it firmly, reaching into the flutes of the pan and making sure there is no bump of thicker dough remaining in the center of the dish. Cover with plastic wrap and chill at least 30 minutes, or overnight. 6. If using the pastry today, preheat the oven to 350F while the pastry chills. Fill the pastry shell with pie weights and blind bake (i.e. : without filling) for about 20 minutes, or until the surface appears dry and the pastry is golden you can smell browning butter. Cool completely on a rack before filling. Carefully remove the exterior ring of the pan, leaving the baked and cooled shell on the little metal pie plate tray thingie (that's the official culinary term, in case you weren't yet familiar). Place the shell on a serving plate then fill with your choice of creamy filling (suggestions above). Heap with fresh berries and a sprinkle of finely chopped fresh mint, roughly torn basil leaves, or finely grated lemon rind. It's also quite nice with a drizzle of warm honey. 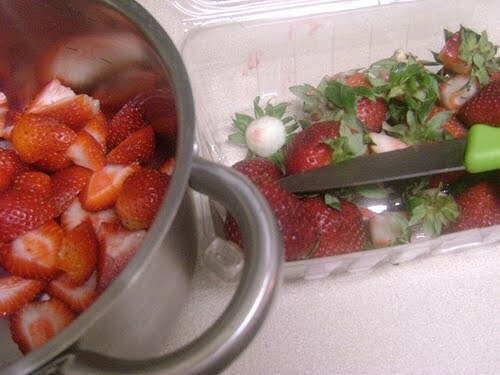 Place the strawberries in a small pot and add water, enough to cover the bottom to prevent scorching. Cook over medium heat. As it thickens, it will start bubbling but not enough to cook over. Stir occasionally, adding more water if necessary, and add honey to taste. Cook until it’s thickened to preferred or desired consistency. For mine, I cooked it for about 30 minutes. The longer it cooks, the thicker it becomes. When it’s thick enough for you, remove from heat and transfer to a container or jar. The jam will continue to thicken as it cools. Cover and refrigerate. It will keep for a week in the fridge and up to 1 month in the freezer. Enjoy! Prepare dough package: Mix all the flours with the salt and both gums in a large mixing bowl. Form a well in the centre and pour the water into the well. Using your hands, gradually bring the flour blend over the water, gathering until it's well blended and is starting to come together. Gently knead just until it starts coming together to form a dough. Pat dough into a rough ball and wrap tightly in plastic wrap. Chill in the fridge for 1 hour. Prepare butter package: Sprinkle 1/2 tablespoon of superfine sweet rice flour on a piece of wax paper or parchment paper (I used parchment paper). Place sticks of butter on top, and sprinkle with remaining 1/2 tablespoon of flour. Cover with another sheet of paper and use a rolling pin to pound the butter to soften and flatten to about 1/2 inch. Remove the top sheet of paper and fold the butter in half on to itself. Place a new sheet of paper on top and continue pounding until butter is about 1 inch thick. Repeat two or three times, until butter becomes pliable. Use your hands to shape butter into a 4-inch square. Wrap in plastic wrap and put in fridge until it is chilled but not hardened, for no more than 10 minutes. Assembly: Take the dough out of the fridge and place on a lightly floured counter or work surface. (If you have a silicone mat, you may use that instead for easier clean-up.) Gently roll the dough into a 9-inch round with a rolling pin. Take the butter package out of the fridge, unwrap, and place in the centre of the dough round. Lightly score the dough with a paring knife to outline the butter square. Take the butter off and, starting from each side of the centre square, gently roll out the dough to form 4 flaps, each 4 to 5 inches long. Do not touch the raised square in the centre of the dough. Put the butter package back in the centre and fold the flaps of dough over it, so that it is completely enclosed, pressing to seal it with your hands. Use the rolling pin to press down on the dough at regular intervals, repeating and covering the entire surface area, until it is about 1 inch thick. Gently roll the dough into a large rectangle, with one of the short sides nearest to you. Be careful not to press too hard around the edges and keep the corners even as you roll it out by squaring with the rolling pin or your hands. Starting at the near end, fold the rectangle of dough as you would a business letter, folding in thirds. This completes the first single turn. Wrap in plastic wrap and chill in the fridge for 45 minutes to 1 hour. Take the dough out of the fridge and repeat the process, giving it 5 more single turns. Always start with the flap opening on the right as if it were a book; you can mark the dough with your knuckles after each turn to help you keep track (I used a sticky note with numbers jotted down, indicating the number of turns, and crossed them off one by one after each turn). Chill 1 hour between each turn. After the sixth and final turn, wrap the dough in plastic wrap and refrigerate for at least 1 to 2 hours or overnight before using. Baking time depends on what the puff pastry is used for, although I emailed Helen and she recommends blind baking it (pre-baking just the pastry, without any filling) for 10 to 15 minutes. I did so at 350 degrees Fahrenheit before using it as a crust for my strawberry tart and baking it again for 15 to 20 minutes at 375 degrees Fahrenheit. There is no need to butter or flour the pan you use for the puff pastry as there is enough butter in the pastry already to prevent it from sticking. After being refrigerated overnight or at least one day, the crust is blind-baked first, weighted down with pie weights, such as dried beans or uncooked rice, for 10 to 15 minutes in a pre-heated oven at 350 degrees Fahrenheit. Pour in the strawberry jam filling and bake in a pre-heated oven at 375 degrees Fahrenheit for 15 to 20 minutes (I don't know why I wrote 14 to 20 minutes in my post). Remove from the oven and cool, before chilling in the fridge until the filling is set or overnight. Yum, scotch tablet looks incredible. Reminds me of maple candy which might just be my favorite thing ever. What could be better than butter and sugar and cream? I didn't know what Scotch Tablet was, so I had to look it up. Having looked it up, I now have to make it. Losing the weight I gained on vacation is going to take a while. I made the Baked Banana Pie; my family loved it. On reflection, I didn't follow the recipe exactly. I increased the eggs to 3, as 2 sounded skimpy. I didn't measure the vanilla (I never do), but just put in a good splash-- probably 2 or 3 times the amount called for. It was very tasty. that Scotch tablet looks a lot like the butter fudge, cream fudge, clotted cream fudge or even the honey fudge we ate during vacation in Dorset this spring. I can't wait until you post that recipe. I tried searching for a butter fudge recipe but all the fudge recipes had chocolate in them. The husband and kids loved that stuff. 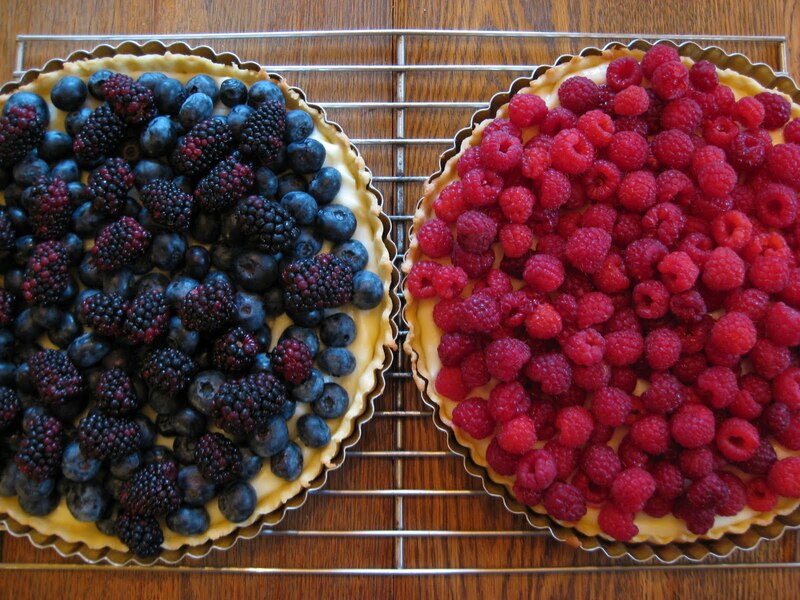 I wish I was in Seattle to help take care of the "failures"
As for the berry pies - I love the idea of putting a certain pie on one's calendar due to the peak berry season! I'll definitely be doing those at the end of July here. I thought about using superfine, but I decided grinding down two whole pounds of sugar would make a mess. Though, if you look at my kitchen floor... clearly just weighing out two pounds of sugar is messy. I'm making tablet right now and I've changed a few things (both method and ratios), now I'm sure the sugar is dissolved before we start the caramelization process. Hopefully that makes the difference in this batch. I vaguely remember eating whisky Scotch Tablet in Scotland. Got it from an amazing candy store in Oban. Mmm, I think Tablet was one of my (many) favorite things from Scotland. De-lurking here. I love your blog- one day I will make science cookies, once I get find some suitable icing here. In the meanwhile, this tablet recipe worked well for me (Its a passed down through Grandmothers recipe). I added some drops of vanilla essence just before pouring out, I guess whiskey/rum/cherries what ever can be added at that point. Sorry for the length, I only have it as a word file. Melt the butter in a LARGE saucepan, add the condensed milk, and use the condensed milk tin to measure out the milk or cream. Add the sugar and bring it gently to the boil over a moderate heat, stirring CONSTANTLY (it burns VERY easily), and stand over it as it simmers, continuing to stir constantly, and cook until it's a nice golden brown like oiled cedar, or cherry. Lighter means softer and sweeter, darker means firmer and more flavour. About 15 to 20 min, I think. Remove from the heat. As it cools, continue to stir, scraping the mixture off the sides of the pan and stirring it into the main mass. It will start to thicken as you do this. When you can scrape the spoon across the bottom of the pan and see metal for a second or so, it's ready to pour. Pour it into a foil-lined tray to cool (Actually I used a oil brushed non- stick pan instead of foil), but DO NOT scrape the pan - the stuff clinging to the pan will have a different texture. !! Remember it's VERY hot - hotter than boiling. !! However, waste-not, want-not .... scrape what's left in the pan onto a spare piece of foil to cool. It'll be edible and very nice, but not as even as the main tray. I was wondering about the tin size. You know, ratio-wise this looks extremely close to what I made today. Your grandma is spot on, it came out fantastic. Though I didn't add the condensed milk until after I dissolved the sugar in the butter and mixture of milk/cream. I was being hyper cautious about crystallization with this batch and then I beat the heck out of it at the end (like fondant) and it came out great. I got exactly the fine texture I was aiming for. Which was good, because testing this candy uses up soooo much sugar! I made a batch today, according to a recipe I found via Google. It came out identical to a Mexican candy my mom used to buy for me when I was little. Small world. As a scottish reader I can tell you that tablet is really tricky to master. The key to getting the best texture is to 'grain it' (stir constantly, scraping the stuff from the sides of the pan and pressing new stuff against the sides of the pan with the spoon) for a full 10 minutes as soon as it comes of the heat. Eventually the stuff on the side of the pan will take on the texture you are looking for and you can stop, pour it out and rest your arm! also, you need to use golden granulated sugar. Ah, tablet... I'm surprised people over here still have teeth. I do love it but can't have more than a square at a time as it is just SO sugary! I've definitely had whisky tablet a couple of times. Shannon - Tablet and Dorset or Devonshire fudge are a little different in their texture. Tablet is grainy and I find it sweeter, while fudge has that smoother, slightly chewy texture. Mrs Humble - did you go to that candy store on Hanover Street (I Love Candy) while in Edinburgh? i had never heard of tablet but these lovely comments have peaked my curiosity. look forward to your recipe post on this ms.h...since i enjoy american fudge i am eager to learn about tablet...my favorite american fudge is a layering of dark chocolate topped off with a layer of white chocolate...can this be accomplished in a tablet? I love reading your blog, it's filled with all the sweet stuff that I crave daily! Scotch tablet...goodness me! Trust the Scottish to come up with something that belongs to the candy family but sounds like a representative of the medicine and wellness department! Yea my tablet is a bit more moist and not as crumbly as the store bought stuff fresh out of the pan. I figured it was a bit like fudge, and like fudge would take on those qualities when it had a bit of time to well... go stale. 24 hours later and it is doing exactly that. So you're absolutely right. This is good stuff... dangerous stuff though. I think there are 9000 calories in this batch. It's worth it though because it's so delicious. I know what you mean. I feel like I am going to have my hands full describing how to execute this recipe. Tablet is very similar to fudge and it certainly can be layered in the same manner. Though I've not seen it done so. Clearly there are whiskey tablets, I wonder if there are any other flavors out there? I know there is a Russian version made with golden syrup (which probably doesn't change the flavor much) and a Canadian spin on it made with maple syrup. I didn't make it to that candy store. My weekend in Edinburgh was complicated by the little one's decision that she was done with this traveling business. I was lucky to find Lickety Splits (as well as a fudge shop near by) right before I left town or I would not have been able to sample any local candy. I'll have to hunt it down on my trip back next year. Ms Humble, I truly enjoy your blog and all of your efforts. I need to tell you though that the term 'Scotch' should only be used when speaking Whisky or Eggs (Scotch Eggs). In fact it is somewhat offensive to use when referring to anything else.. especially people (which you have not done). So, for Scottish Tablet (to which I blame my huge collection of fillings on) I would agree that Whisky is a flavouring, however, I have never heard of anything else being added to it. Thanks. That's a good thing to know. Edited. I think I caught all of them. Now the confection is only referred to as Tablet or Scottish Tablet on the blog. Mill Fudge Factory in New Hampshire bases their fudge on a Scottish tablet recipe--and they sell a number of flavors, including Cappuccino and Maple Whiskey (I'll testify to the virtues of those two).